Rising from Bethesda Terrace is Bethesda Fountain, with the famous Angel of the Waters statue atop. The statue references the Gospel of John, which describes an angel blessing the Pool of Bethesda and giving it healing powers. 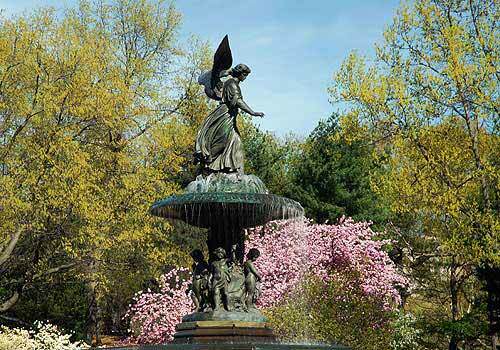 The fountain commemorates the Croton water system, which first brought fresh water to New York City in 1842. The angel carries a lily in her left hand — a symbol of the water's purity, very important to a city that had previously suffered from a devastating cholera epidemic before the system was established. The piece is the only statue that was commissioned for the Park. Created by Emma Stebbins, it also marked the first time a woman received a public art commission in New York City.